Get crafty for cats! Are you handy with a needle and thread? Or skilful with your knitting needles? Cat Protection Craft Club is a fun way to get involved and help support our cats and kittens. We all know how much cats love to curl up somewhere soft and take a catnap, if you spent two thirds of your life sleeping, you would appreciate a soft, warm bed too! At Cat Protection we furnish all our feline apartments with bedding for them to snuggle in, this is especially important in the cooler winter months. We also provide our cat’s apartments with hammocks so that they have somewhere to lounge about and watch the world go by. When we get especially shy cats they love to burrow under their blankets, only peeking out for the occasional chin scratch. You can help make our cats and kittens more comfortable during their stay by providing blankets, beds and toys made with love. The Craft Club is designed for all levels of expertise, for beginners we have prepared patterns and materials cut out and ready to be collected from our Adoption Centre. 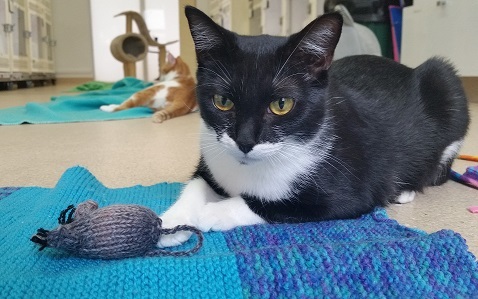 For the more experienced we have some cute crochet cat toys to keep you busy. Please send us photos of your crafty creations and we will share them on our Facebook page or if you want to share your very own kitty pattern you can send an email to info@catprotection.org.au with the subject heading Craft Club. Don’t forget you can create any of these designs for your cat or donate them to the cats and kittens at our shelter.